Acting on a Supreme Court order, the MCD today began sealing of commercial establishments in residential areas in the Capital whose owners have failed to give a requisite undertaking amidst stiff opposition from the trading community. More than half a dozen overbridges are being constructed in Ghaziabad’s Mohan Nagar which along with an eight-lane road to Electronic City will ease traffic congestion and make movement of vehicles and commuters smooth in the town. 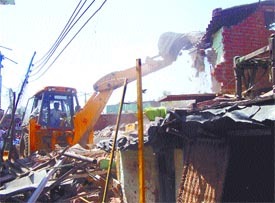 An MCD bulldozer demolishing a slum cluster near Pragati Maidan in the Capital on Wednesday. The Delhi High Court today praised Uttar Pradesh government for clearing all encroachments on its side of the Yamuna but expressed dissatisfaction at the Delhi Government’s failure to clear the unauthorised structures in and around the river. A Division Bench headed by Justice Vijender Jain directed that the vice chairman of the DDA shall be personally present in the court at the next hearing if the Delhi Government fails to clear the encroachments before April 31. The main focus of this year’s budget of the New Delhi Municipal Council (NDMC), which is all set to be tabled tomorrow, will be on beautification drives in various locations of the Lutyens’ Zone in view of the Commonwealth Games 2010. The DPCC president, Mr Ram Babu Sharma, today ruled out resignations of its legislators on the issue of holding offices of profit even as party workers held a violent demonstration outside BJP MP V K Malhotra’s residence demanding his resignation from Lok Sabha for the same reason. Urban Indians are among the top 10 most frequent fast food consumers across the world and with easy access to junk food, people are skipping regular meals, points out a study conducted by AC Neilsen Research firm. The murder of the former vice chairperson of the Municipal Council, Mrs Sangeeta Rajje, is yet another sign of deterioration in the law and order situation in the district. Even as an inquiry conducted by the Vigilance Department has found senior officials and contractors of the Haryana Urban Development Authority (HUDA) involved in “corrupt practices and various irregularities” in the execution of various works, no action has been taken against the guilty. Amartya Sen’s latest book, ‘Identity and Violence: The Illusion of Destiny’, which revolves around the worldwide turbulence caused by the evolution of singular cultural societies in to a truly multicultural world order, was released on Tuesday at a function organized by Penguin-India at the Habitat Center, New Delhi. The land prices in Noida continue to be sky high. In a scheme for 10 shopping malls, commercial land in Sector 50 brought in the highest bid of Rs 1.36 lakh per sq metre and a total of Rs 261 crore for land for 10 malls. A teacher of Azad Memorial Inter College, Dasna, has been serving on the basis of a fake B Ed degree for the last 13 years. The college authorities have cancelled his appointment after it was discovered his degrees were fake. The abducted grandson of a Delhi Police Sub-Inspector has been recovered by the Noida police from the jungle in the Dankore area. The police claim the kidnappers had abandoned the child under pressure from the Noida police. With the deadline set by the apex court for filing of affidavits by those who are running illegal shops and other commercial establishments in residential areas expiring yesterday, the civic body started sealing such premises in all the 12 zones barring Narela under tight police security. The MCD had till yesterday received 1,677 affidavits from shop owners. The action comes a day after the Union Urban Development Ministry issued a notification allowing mixed land use on 118 roads of Delhi in an attempt to “provide relief to small traders”. The Court had last week extended the March 29 deadline for sealing of shops to June 30 and asked shop owners to file an affidavit by March 28 to escape immediate closure of their premises. Traders claimed that around 5 lakh commercial units were facing closure because of the Supreme Court order. Sealing of commercial establishments is taking place in Ghittorni, MG Road, Ring Road-Punjabi Bagh to Mangolpuri, Esplanade Road near Chandni Chowk and Jama Masjid, Arya Samaj Road, Wazirabad Road, South Extension, Green Park, Africa Avenue, D. B. Gupta Road near Sheila Cinema and Ghanta Ghar to Shakti Nagar. The MCD had identified 189 roads in the Capital where action would be taken and has formed five special teams, comprising officials of Building and Town Planning department along with members of RWAs to oversee the process. It has, however, exempted 14 categories of shops selling items of day-to-day needs. These include shops selling vegetables, fruits, flowers, grocery, stationery, pan, bidi, cigarettes and bakeries, tailoring shops, barber shops, cyber cafes, STD booths, photocopier and spiral binding centres. The Supreme Court had also ordered constitution of a committee to monitor the sealing drive and made it clear that no more extension would be given after June 30 to stop the misuse of residential premises. It has warned that those who failed to give undertakings would be proceeded with perjury and for violation of its order for Contempt of Court, but exempted commercial establishments set up prior to September 1962 and the Master Plan to continue provided “they have not got their building sanctioned for residential purpose”. The areas expected to be worst affected are Greater Kailash, Kailash Colony, Green Park, Lajpat Nagar, Defence Colony, Hauz Khas, South Extension, Malviya Nagar, Munirka, Aurobindo Marg, Mehrauli-Gurgaon Road, Rajinder Nagar, Nariana, East and West Patel Nagar, Tilak Nagar, Kingsway Camp, Model Town, Laxmi Nagar, Patparganj, Naveen Shahdara, Alipur, Nangloi, Wazirpur and Karampura. These are some of the residential areas where big markets housing showrooms of prominent companies have mushroomed. The work on the overbridges near the old bus stand and Mohan Nagar is progressing. While the old bus stand overbridge is expected to be completed by April 30, work on the railway overbridge and widening of the road near the Mohan Nagar crossing is progressing at a rapid pace. A 600-m long overbridge from ALT Centre will connect it with Meerut Road over the railway crossing and another from over the Razapur railway crossing will connect Kavi Nagar to NH 24. An overbridge will connect the Hapur road T- point to the GT Road near Takur Dwara Mandir. The one on the old bus stand will connect to Meerut Road opposite the Hyundai showroom. The construction of these overbridges was approved by the GDA board on proposals initiated by District Magistrate Santosh Yadav in January. The UP Bridge Corporation has been entrusted with the construction of the overbridges. Besides, a committee under the District Magistrate will make recommendations about where Transport Nagar should be located. No tenders are to be called for the construction of these overbridges as the construction work of the UP Bridge Corporation is rated highly. The eight-lane road will connect Electronic City to UP Gate. This project has been possible with the cooperation of the Union Surface Transport Ministry, it is learnt. The ministry will also fund this project. The Government of India has agreed to grant part of the funds for this project in Ghaziabad out of the Rs 60 crore left with the ministry as unspent. The Delhi High Court today praised Uttar Pradesh government for clearing all encroachments on its side of the Yamuna but expressed dissatisfaction at the Delhi Government’s failure to clear the unauthorised structures in and around the river. A Division Bench headed by Justice Vijender Jain directed that the vice chairman of the DDA shall be personally present in the court at the next hearing if the Delhi Government fails to clear the encroachments before April 31. The bench, however, recalled its earlier directions for the personal appearance of the UP Chief Secretary after being satisfied with the steps taken by the neighbouring state in clearing the encroachments on its side of the river. The UP Government in its reply and affidavit had submitted that it had cleared all encroachments on its side besides fencing the area to prevent future encroachments. The bench had, during its earlier hearing, sought the personal appearance of the top civil servant of UP for an explanation on the issue. “We are satisfied with the steps taken and the reply submitted by the irrigation department of Uttar Pradesh,” the bench observed while recalling its earlier directions. The court also asked the monitoring committee headed by Justice (retd) Usha Mehra to take the assistance of organisations like ISRO to obtain satellite view of all the encroachments to ensure their early clearance. However, the court was not happy at the steps taken by the Delhi Government in clearing the encroachments. The court regretted that though it has passed an order on November 16, 2005 for clearing all encroachments, the DDA vice chairman who was entrusted with the job had not shown the necessary zeal in implementing the directions. Justice Jain also ruled that no senior officer entrusted with the job of clearing the encroachments shall be sent by the government for election duties. The court’s ruling came after counsel for the DDA claimed that certain officers were not able to devote time for clearing the encroachments as they were pre-occupied with election works in some of the states. The bench also directed that the DDA vice chairman shall be personally present at all the meetings convened by the monitoring committee headed by Justice (retd) Usha Mehra. Fifteen roads of this area have been identified for this purpose and the crossroads connecting to these roads will be developed on the lines of that in Chandigarh. According to a senior officer of the council, this time planning has been done for the next four years instead of the usual one year, in view of the Games. “Our emphasis will be to beautify the whole council area on the pattern of international standards. At first, the traditional buildings in Connaught Place area will be renovated so that their original looks are intact. The lanes and the bylanes of the area will be made free of encroachments. We are also planning to give original look to the famous Gole Market building,” he said. He further informed that they were planning to redevelop Talkatora Garden in three phases. “We are also toying with the idea of constructing a huge Barat Ghar inside the garden to cater to the needs of people in the marriage season. Both the Talkatora and Shivaji Stadiums will be upgraded for the Commonwealth Games. We are also planning to beautify the lawns of India Gate and Rajpath. Construction of sub ways in the area is also on the agenda. The planning of constructing multi-storey parking at Curzon Road and Baba Kharag Singh Marg is also in the final stage. We are also planning to beautify the area near Baba Kharag Singh emporia,” he said. He said that the focus would also be on upgrading basic infrastructures in the council area. “Taxi stands, roadside kiosks and parking lots will be given a new look. We are also focusing on the better development of about 40 markets located in the council’s area. We are going to spend Rs 5 crore for this purpose. The balance amount will be shared by the concerned markets associations. Lighting systems on roads and bus shelters in the council area will also be improved”. According to president of Palika Bazar Shopkeeper’s Association Dinesh Gaur, their business might be affected due to the council’s decision of implementing uniform sign board code. “We have no objection in uniform size but due to uniformity in colour, our business might be hampered as all shopkeepers are working for various companies and their different brands. Even their logos are different, so how can we manage with uniform sigh boards. This decision should be rolled back in the budget seeing the common interest of our community,” he said. The DPCC president sought to downplay the criticism directed against its 19 MLAs and an MP, saying that “All parties, whether its BJP or Congress, are faced with the problem. The Centre is looking into the issue and trying to build consensus among different parties. We will wait for its outcome”. He said none of the 19 Congress MLAs and MP Sajjan Kumar would resign over the issue. The Opposition BJP in Delhi yesterday petitioned President A P J Abdul Kalam seeking disqualification of 19 Congress MLAs and Sajjan Kumar on the ground that they occupied offices of profit under the NCT government. Several Congress workers were injured in clashes with police while demonstrating outside Malhotra’s residence demanding his resignation from the Lok Sabha for allegedly holding an office of profit. President of Delhi Unit of the BJP, Dr Harsh Vardhan, condemned the demonstration by the Congress party workers. He termed it as “low grade politics”. Trying to focus attention on the wrong eating habits of the people, especially among children, National Institute of Nutrition, ICMR (NIN) in its report published recently says that 98 percent of school going children who are apparently healthy have inadequate intake and lower levels of many essential micro-nutrients. The report suggests that approximately 50 percent of these children are deficient in necessary vitamins and minerals. UNICEF too has reported that one in three of the world’s malnourished children are Indians. Referring to the implications of the study conducted by NIN, Dr Shahnaz Vazir, who completed the mental aspect of the study said, “Results of the NIN study demonstrate that daily consumption of micronutrient-fortified beverage significantly improves parameters of growth, mental functions and bone health while decreasing the duration of common illnesses”. Commenting on the school children who were part of the study, Dr B Sivakumar of the NIN’s principal investigator said, “They are reasonably well to do, neither rural nor urban. We can call them semi-urban since they are from proper middle class families”. Experts suggest that daily intake of any supplements along with a base formulation of any kind should be able to provide 7.3 kg of protein, 2 gm of fat, 208 Kcal of energy, 176 mg of calcium besides 100 percent iron. The study further says that poor diet intake, cooking or processing losses and poor bio-availability are some of the reasons for the poor biochemical status of micro-nutrients in children from the middle class. Highlighting the need for a balanced diet, it was mentioned that zinc deficiency for instance, is responsible for stunted growth. It says the target to achieve an optimal nutritional balanced diet in children is not a hard task for parents considering the long term negative impact their children might face in the long run, like beri-beri, anaemia, scurvy and dementia. To make matter worse, the police have still not found any clue regarding the murder. It may be recalled that assailants shot dead Ms Rajje and injured her sister-in-law, Ms Sushma, near her residence at Arjun Nagar last night. The latter is admitted to a local hospital. The Senior Superintendent of Police, Mr Hanif Qureshi, said that the husband of the victim, Rajesh alias Rajje, had also been shot dead in his office in June 2002. He was allegedly involved in liquor smuggling, satta racket (gambling) and dealings in disputed property business. It may be pointed out that Rajje’s brother Virender had also been shot dead eight years back when the assailants had come to kill Rajje, added the SSP. The brother of Sangeeta Rajje, Mr Inderjeet, a resident of Palwal, has lodged an FIR, said the SSP. According to the police sources, Ms Sangeeta Rajje was looking after the “business” after the murder of her husband in 2002. She was also one of the accused in the murder of Sunil alias Tekla, a property dealer, near Bhuteswer Mandir, three years back, the police chief said. Recently, she was acquitted in case. A legal notice served to the Chief Secretary and the Chief Administrator HUDA by a local social activist alleged that despite registration of an FIR about two years ago, no action has been taken against the guilty persons. In the notice served through Mr Gaurav Sharma, the complainant, Mr K.L Gera, said that an FIR was lodged on the complaint of Mr Dhan Singh, DSP, on February 4, 2004 under sections 409, 420, 467, 468, 471 and 120-B of the IPC against an Executive Engineer and other officials along with some contractors of the department. Alleging that while there were numerous instances of bungling in the execution of development works, the notice has demanded action from the authorities or threatened a PIL in the court over the issue. Sen’s extremely thought provoking work is almost Utopian in its expression favouring a perfect multicultural global order based on humanism and tolerance. While introducing his book, Sen says, “The hope for harmony in the contemporary world lies in the understanding of pluralities in human history”. He stresses that “There is a need to reflect today – the cultivation of a singular identity can kill and kill with abandon”. Sen gives an example from his own life saying that he was eleven years old when he first encountered murder. He later was a mute witness to the Hindu-Muslim riots that broke out in the 1947 in India. The author also referred to terrorism, September 11, bombings in Britain and the chaos created by violence today the world over. Sen firmly puts across the idea in his book that violence survives today due to the illusion created by a sense of unique identity. It is an identity created by feelings of loyalty to race, religion, nation and region that have created the turbulent mess that exists in the globe today. The author says that “a solitarist approach can be an excellent way of misunderstanding nearly everyone in the world. Take the case of collectivities that have arisen out of region, religion, race, nation ete etc… Each of these collectivities has a particular identity and that is wherein the problem lies”. Sen stresses that in this situation, individual choice has a central role to play “since we belong to a great many groups, the importance we attach to these must have an element of choice”. By this the author argues that a man should have the “choice” to change his group. People should accept their groupings out of choice and not because they are passed down to them. This would destroy the singularity and rigidity of groups and encourage true multi-culturalism. Amartya Sen’s insightful talk on his book was followed by a lively panel discussion by Najam Sethi, editor in chief, The Friday Times, Pakistan and N. Ram, editor in chief, The Hindu Group. The two editors are close friends and long time associates of Sen. The 615 sq metre plot for this shopping mall was annexed by a Delhi firm, M/s Spray Plant Ltd, for over Rs 104 crore. In all, tenders for eight malls had been called. M/s Agarwal Midos Pvt Ltd had made a bid of Rs 31.11 crore for a plot measuring 1878 sq mt in Sector 26 here. Tenders for setting up a mall each in Sectors 44, 61, 70, 92 and 195 have also been received. The Noida Authority will be richer by Rs 261 crore by selling land for these malls. A teacher of Azad Memorial Inter College, Dasna, has been serving on the basis of a fake B Ed degree for the last 13 years. The college authorities have cancelled his appointment after it was discovered his degrees were fake. They have also apprised the District Inspector of Schools, Ghaziabad, Mr Arum Kumar. The latter said action would soon be taken against the accused teacher and an explanation from the institute management would also be sought. The accused, Rawhil Ali, was working as an assistant teacher at Azad Memorial Inter College. He had allegedly arranged a fake B Ed degree from Sampurnanand University, Varanasi, in 1986 and secured this job on its basis. After a thorough inquiry, the institute has cancelled his appointment from July 1993. The accused is to be asked to refund the amount received by him as salary and the college management is likely to file a criminal case at Mussoori police station. SI Balbir Singh is a resident of Rithala village. His three-year-old grandson, Himanshu, was kidnapped from outside his house on March 21. Soon the kidnappers demanded a ransom of Rs 12 lakh for freeing the child. The police could locate the kidnappers in the Dankore-Jhajjar area through surveillance. The Noida police started combing the Dankore area to locate the child. The SO, Dankore, Mr Rashid Ali, said while he was patrolling near Fatehpur an informer told him the kidnappers were with the child in the Latipur village jungle. The SO said the kidnappers left the child and fled on seeing the police.